Update: Lisa Krach-Vienna, co-owner of the Vienna Restaurant and Historic Inn has responded to the Hotel Hell broadcast featuring her family’s historic inn and restaurant. In a post on her personal Facebook page, Lisa described Hotel Hell’s portrayal of the Vienna Inn as saddening for her entire staff and family. 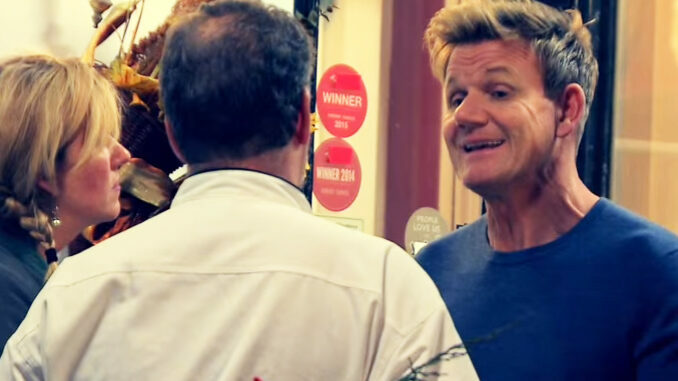 Viewers of the episode will know that Gordon Ramsay portrayed Lisa as ungrateful – among other things. You can read Lisa’s full response below. I just want to say thank you to all are very loyal and wonderful friends and customers over the past 14 years. It was a very difficult decision for us to participate. We thought we were making an educated decision based on our skills, our hard work and our faithful clientele base. The portrayal of the Vienna deeply saddens our entire staff and family. Thank you for all the kind comments, wishes and letters of support. We truly are incredibly appreciative of your time and passion for the Austro-Hungarian and German traditions we’ve tried to preserve. This too shall pass. As for the Gordon lovers in the Vienna haters God bless you all. We need to get back to work. On the next Season 3 episode of Hotel Hell, Chef Gordon Ramsay and crew are in Southbridge, Massachusetts to help out the owners of the Vienna Restaurant and Historic Inn. Modeled after an historic Austrian Bed and Breakfast, the Vienna Inn has a reputation of being outdated and out of touch. Gordon thinks the hotel owners are getting too cozy with their guests. The establishment is owned and operated by husband and wife team Jonathan Krach and Lisa Krach. It’s also worth noting that Jonathan is a chef, and the couple are also involved in a couple of other restaurants in the area. This week’s episode of Hotel Hell at the Vienna Inn was filmed back in November, 2015. The Vienna Restaurant and Historic Inn’s website is certainly in need of a design update, however, the owners also have a Facebook page that is updated on a fairly regular basis. More photos from the Inn and Restaurant are available over at Instagram. You can also check out co-owner Lisa Krach’s personal Facebook Page – Lisa is very active on Facebook and worth checking out. Back in July, 2013 the inn suffered fire damage. During the Hotel Hell visit, Lisa wrote on Facebook that Chef Ramsay cut the restaurant’s menu by a third – but said they could add additions if they wanted. The new look and vibe of Vienna is almost finished, the dust is settling, our Hotel Hellish temperature is almost back to normal…Gordon has left town. We can’t lie, it was a very challenging difficult week for us with really long hours. Hopefully a few of you got a glimpse here and there throughout the week. He really loved our town and thought we could really pull off this new concept. All we can say is we did our very best we just hope that all of you will still talk to us and think we’re cool. Everyone’s asking when this will air. We think sometime in early spring. So… Be sure to make your reservation today the phones are ringing be the first to see it! Overall, it’s probably fair to say that Jonathan and Lisa Krach are doing well as entrepreneurs. Food reviews are overwhelmingly positive and any issues with the inn can probably be resolved with upgrades and more attention to detail. Since Chef Ramsay’s intervention, the reviews for the Vienna Restaurant and Historic Inn are very positive. The food and service, for the most part, certainly appears to be a winner. Let’s take a look at some excerpts from a few of the reviews since the visit from Hotel Hell . Great food and service in a cozy little atmosphere. Went here with family last weekend and we all had a great time. This will be one of our regular spots from now on for sure. We recently had a family get together at the Vienna Inn in Southbridge, MA. It was our first visit there but it will certainly not be our last!! Everything was spectacular. Decided to try this hometown establishment. Not disappointed. The Jaeger Schnitzel was fantastic. And the torte we had for dessert was scrumptious. Over all a wonderful Sunday afternoon. Great place can’t wait to go back the mushroom crepes in a CREAME sauce was incredible! The food is amazing. I love the wiener schnitzel, as did my husband. The mustard sauce served with the dish is mouthwatering. My son has the fillet mignon, which was the size of a cantaloupe, surrounded with bacon. My family has had our birthday dinners at the Vienna year after year. This year was our last. If you’d like to dig deeper into the reviews, you can check out Yelp, Trip Advisor and OpenTable for a great mix of current and relevant reviews. Hotel Hell at the Vienna Inn airs Tuesday, May 31 (8:00-9:00 PM ET/PT) on FOX.